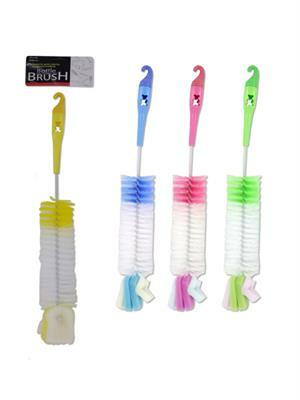 Perfect for cleaning deep inside baby bottles, carafes, thermos containers and more, this Bottle Brush features nylon bristles and a foam sponge tip for cleaning tough messes or gentle cleansing. Each brush has a hook on the handle for easy storage. Comes in assorted colors. Each brush is approximately 15" long. Comes packaged in a poly bag with a header card.